about what we were to do. I went up to the office and Ott and I talked about it. and then again with the girls down to the home. I read a little in the evening. I was very tired. Tuesday May 31st 1892 It was a steady rainy day. Mother and I put in a light quilt for me and worked at that. we quilted by lamp light. Wednesday June 1st 1892 Still raining even worse than yesterday. we worked away on our quilt. got it out and another one just like it in the frames. Ott & Fanny have been married 5 years. 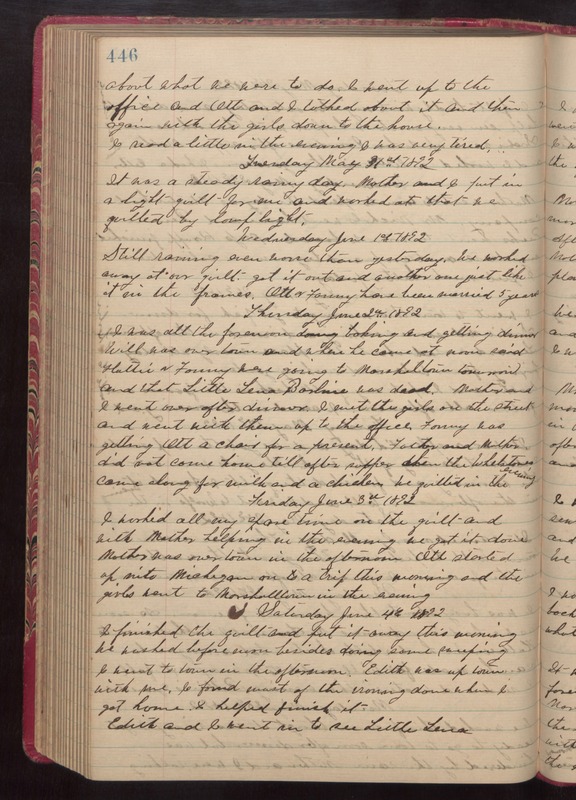 Thursday June 2nd 1892 I was all the forenoon doing baking and getting dinner. Will was over town and when he came at noon said Hattie & Fanny were going to Marshalltown tomorrow and that Little Lena Borline was dead. Mother and I went over after dinner. I met the girls on the street and went with them up to the office. Fanny was getting Ott a chair for a present. Father and Mother did not come home till after supper. Then the Whetstones came along for milk and a chicken. We quilted in the evening. Friday June 3rd 1892 I worked all my spare time on the quilt and with Mother helping in the evening we got it done Mother was over town in the afternoon. Ott started up into Michigan on to a trip this morning and the girls went to Marshalltown in the evening. Saturday June 4th 1892 I finished the quilt and put it away this morning. we washed before noon besides doing some sweeping. I went to town in the afternoon. Edith was up town with me. I found most of the ironing done when I got hiome. I helped finish it. Edith and I went in to see Little Lena.